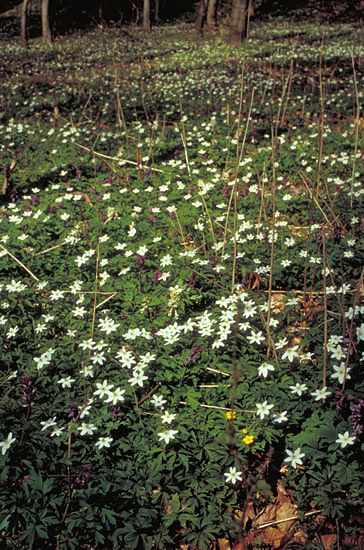 In forests on the good soil in the eastern parts of Denmark a number of plants with an eastern or southeastern distribution in Europe can be found. The right picture shows the forest floor in the forest Store Bøgeskov near the town of Gyrstinge. Together with Anemone nemorosa is Corydalis cava common. Corydalis cava has an eastern distribution and is only known from a few forestes in Jutland particularly in the southernmost parts. It is quite common in forests on the Danish Isles due to more lime in the soil. Corydalis cava can be seen in several different colours. In the picture the red-lilac colour are the most common, but also white and somewhat yellow colours can be seen. 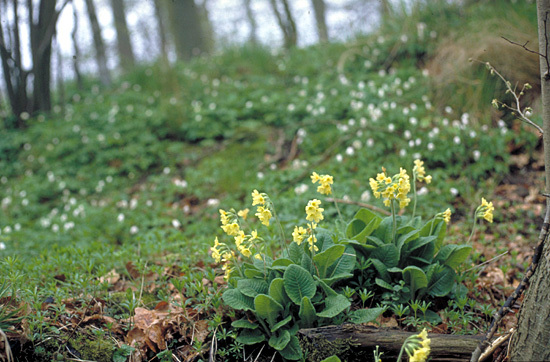 Other forest floor plants which is common in the forests in eastern Denmark are Anemone ranunculoides, Hepatica nobilis and Primula elatior (left picture). Back to The forests in Middle Seeland.